After abruptly canceling their November 3rd show, Strikeforce promised their January 12th event would be of the star-studded variety. Well, as long as the injury bug doesn’t come rearing its ugly head again, the UFC’s little brother is following through on their word. The card features a trio of championship affairs. 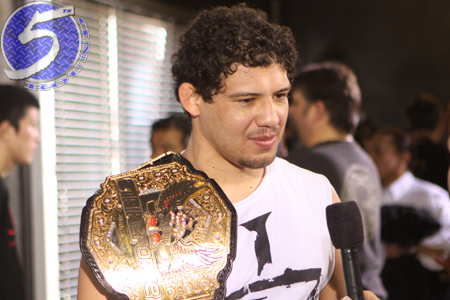 Lightweight king Gilbert Melendez (Pictured) defends his throne against Pat Healy in the featured contest. Luke Rockhold puts his middleweight title on the line against Lorenz Larkin in the co-main attraction. Welterweight champion Nate Marquardt breaks in his belt against Tarec Saffiedine in the night’s third-to-last fight. In addition, Heavyweight Grand Prix champion Daniel Cormier ends his Strikeforce career against Dion Staring. Chesapeake Energy Arena in Oklahoma City, Oklahoma, the venue what was slated to host the canceled November 3rd show, will get another go.